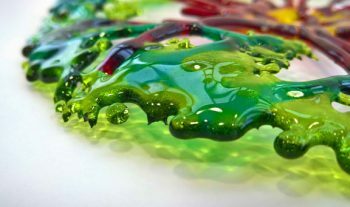 It is the mission of 'in glass' to provide unique customer influenced art glass products that deliver your vision with quality and style. 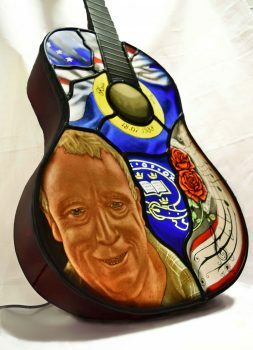 Acid etched and painted stained glass panel installed into a full size 38" acoustic guitar backlit with LEDs. Childhood memories of sticks of fresh rhubarb and warm homemade custard. I started working with glass as a hobby glass artist, making simple leaded or copper foil panels. 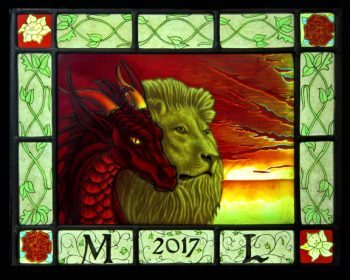 After working with glass for over 10 years I had the opportunity to consider a change in career and grabbed the chance to pursue glass art professionally. Having completed my HND Glass Art Design and Production I have now started on a BA Art & Design at Forth Valley College in order to continue my personal and professional development, particularly trying to focus on glass casting and 3D artefacts. In the meantime I am continuing to develop my leaded stained glass painting portfolio in my personal studio space. I though 2017 was a good year for me, with recognition at Craftex Exhibition and the College’s End of Year show, however 2018 has continued in that vein with my @Way of the Emu’ painted leaded panel receiving the Advanced Panel award and the sponsor’s Quilter Cheviot Award of Excellence and Innovation at the Craftex Exhibition, Trades House Glasgow, and my panel and David Bowie ‘Changes’ cast piece being awards the Lecturer’s Choice Award, at the City of Glasgow College End of Year Show. 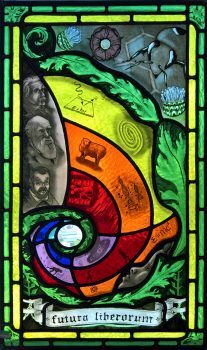 I have continued to take on some private commissions in painted and etched stain glass pieces; each for the customer’s specific events, namely memorials, birthdays, weddings and home decorations. Creating the glass art is one aspect of my work however the other is engaging with the customers. I enjoy meeting with them and listening to their visions and understanding their requirements, ultimately producing a design and glass artefact that gives them great satisfaction in terms of their involvement, the quality of the work and value for money.